Do you own a caravan or RV and do not want to wash your laundry by hand? 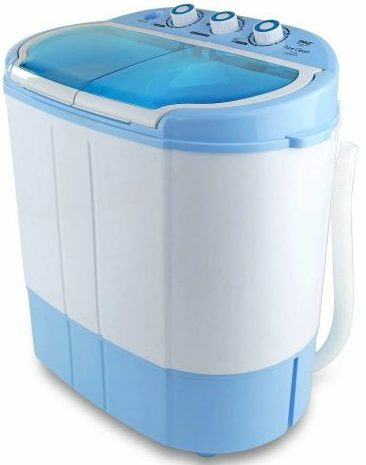 You need one of the best mini portable washing machines to take with you on vacation. Why spend hours washing clothes by hand or taking it to a Laundromat if you can save money. With the domestic appliance, you can use it at home or leave it in the caravan ready to use when needed. The apparatus offers you the same performance compared to larger models and powered by electricity, or you can crank it with your hand. Pick the best one on the list and stop tiring yourself out on your vacation. 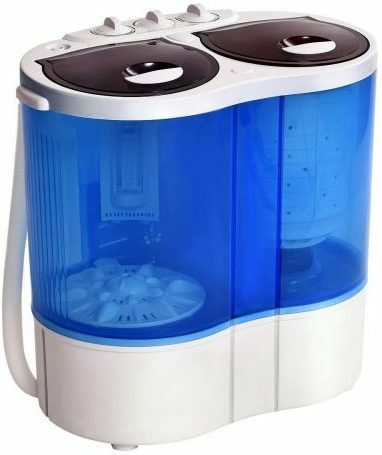 The Best Choice mini washing machine is ideal for small apartments and suitable for limited spaces. You can do light to medium laundry loads and has a 6.6-pound load capacity. The convenient auto-top timer takes care of all tasks, and all you need to do is hang the washing up to dry. Further, it has a drainage tube for disposing of the water. 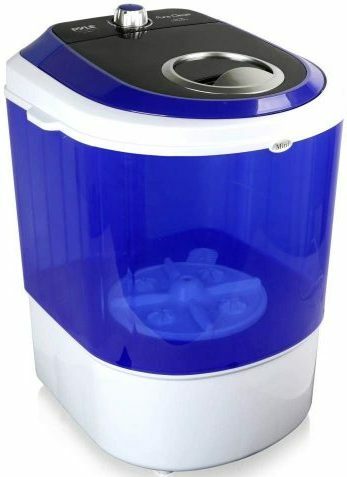 Here we have another affordable mini portable washing machine from Avalon. The hand crank powered appliance needs no power point and can wash up to 5 lbs of laundry. With the pressurized cleaning technology, it cleans the toughest stains and is gentle on clothes. Save money today on this eco-friendly machine by clicking through here and decide for yourself. For limited spaces such as apartments, RV’s, and dorms get the COSTWAY mini portable washing machine. All you need to do is fill it with water and set the timer to start washing. For convenience, it has a drain tube to drain the water. The single tub can soak and dry and comes with a clear lid. On the top of the cover is a handle for easy opening. Nothing comes more portable than the Della mini washing machine. 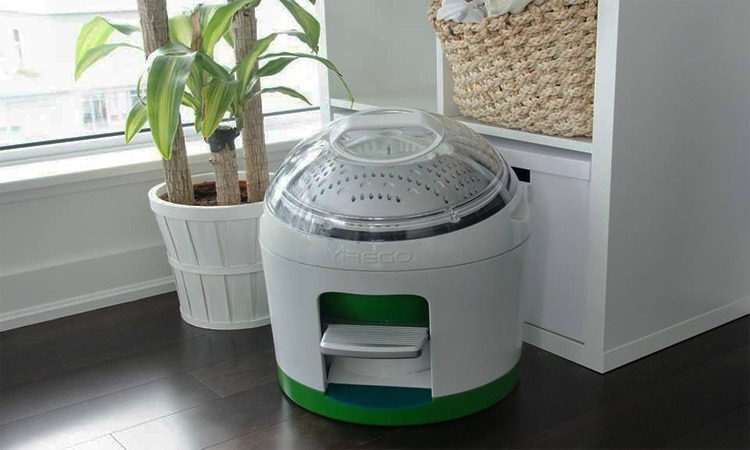 The appliance is perfect for washing laundry in an apartment, dorm, RV and more. The 8.8 lbs load capacity is suitable for doing light to medium washing. The machine stops automatically and has a drainage pipe. 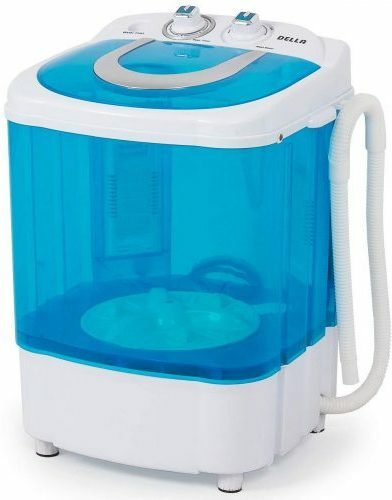 The Pyle is an energy-efficient and water saving mini washing machine. The compact size is great to take with on vacation and washes up to a 4.5-pound load of laundry. The lightweight design makes it able for you to store it in a closet and takes up little space. 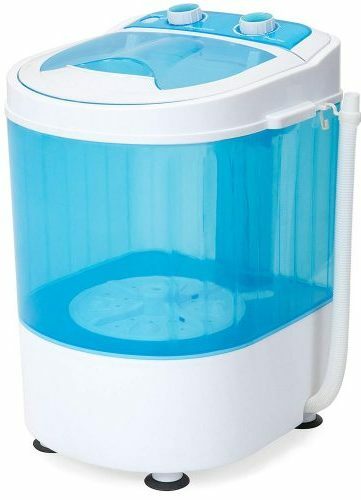 The container of the tub is translucent for you to view the washing cycle and easy to use. As long as there is a working faucet this small appliance is ready to work. 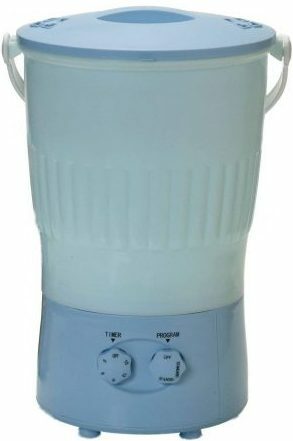 With the Giantex mini portable washing machine, the operation is simple. The appliance has a timer with a spin wash and spins dry cycle. The eco-friendly design uses less water and detergent saving you loads of money and stores comfortably in a corner or cupboard. The next electric portable mini washing machine deserves its name as a Wonder Washer. You can take the appliance with you anywhere to relax on vacation. The equipment saves you time, water, and money. Store it in a closet as it measures 12 x 18-inches. The washing machines use up to 10 liters of water. Furthermore, it has a 15-minute timer and does not have a spin cycle. 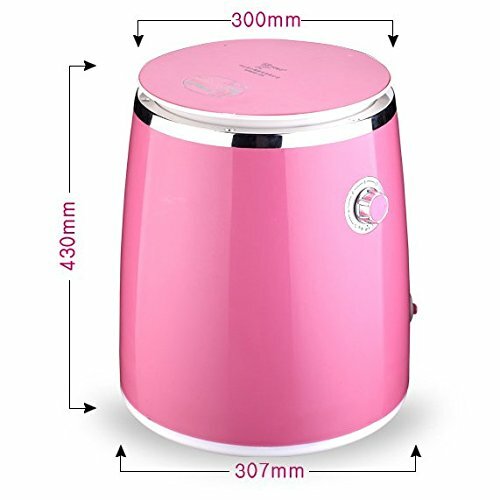 The BXX washing machine has a portable and mini design available in a pink color. For a small apartment, dorm, or RV it is perfect and takes up little space. 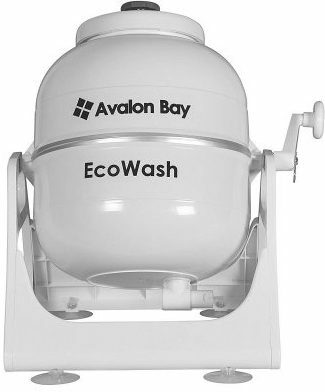 The wash capacity is 3.5 kg and has a 260W rated wash power and load capacity of 7 kg. The compact size makes it able for you to fit it in a cupboard when not used and has a spin dryer function included. With the Black & Decker, you have multiple settings with an LED display and transparent lid. Pick from five wash cycles and load up to 6.6 lbs laundry for cleaning. With the easy connect hose to the faucet you can even find a space for it in your RV. Included is a drain hose with a sink adapter and it has a built-in lint filter. 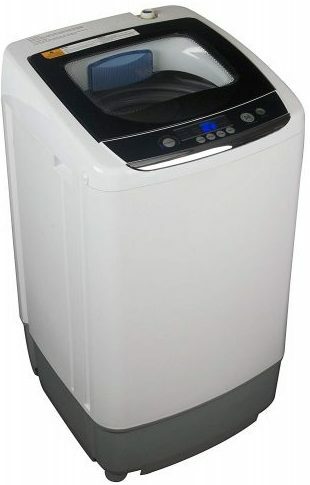 The Pyle portable washing machine has a washer and spin dryer to help make laundering tasks easier. The appliance is easy to use and designed with rotary controls. The 250-watt motor offers high performance, and it has a 7.7 lbs load capacity. The tubs translucent and is easy to install and use. 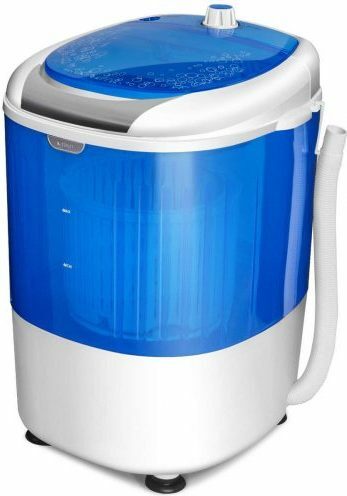 If you need a compact washer to keep your clothes clean, we hope you find the right appliance on our top 10 best mini portable washing machines reviewed here. You can take it with you camping, use it in the dorm, or keep it standing at home. Each appliance has a water and electricity saving function to save you money. Do not struggle to wash your clothes by hand get one of these washers to save time.